Oh boy! Obviously some rewiring was necessary. 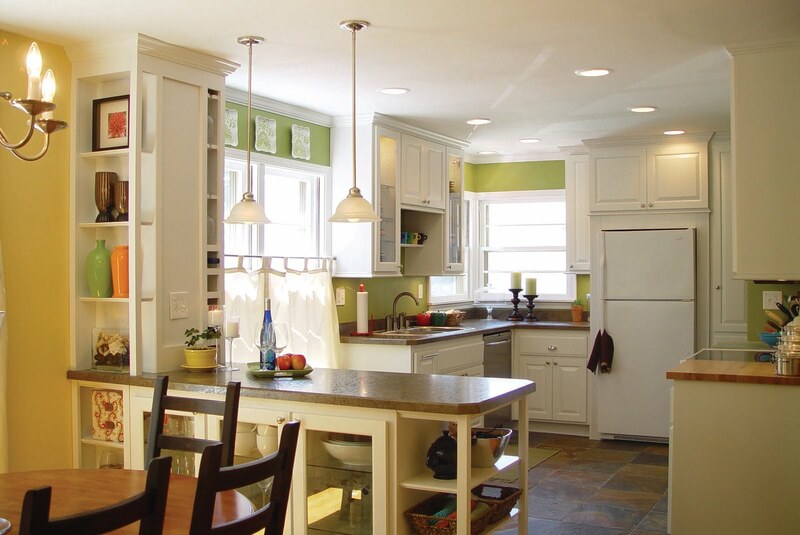 We added can lights, pendant lights and under-cabinet lighting so an electrician was a must. Enter our friends in orange. Turns out the Home Depot employee helping us out could also direct us to an electrician who was super affordable. Thanks to our plaster walls a lot of patching was necessary as well. Did I mention it always gets worse before it gets better? As you can see it is a blank slate at this point. We have done all the work ourselves except for the electric work. My husband did work along side the electrician to help lower the cost. Through this entire fiasco I was pregnant. Nothing like piling on the stress….and you thought this was a blog about balance! The dishwasher obviously still needed to be installed along with the kitchen faucet, etc. We were able to get a new full sized dishwasher with the new layout. We bought a new sink, faucet and over-the-range microwave. Unfortunately we couldn’t afford a new fridge, but we left enough space for the one of our dreams for that “someday” when it does fit in the budget. We also stuck with the same stove. It doesn’t have the look I want, but it works and we aren’t made of money. After all that we welcomed a baby boy and a kitchen almost simultaneously. Voila! The shelving/wine rack houses venting that needed to be rerouted upstairs and that was our creative way of working around the venting. Life gives you lemons you make lemonade…or shelves and a wine rack, but whatever. The peninsula dividing the kitchen from the dining room (remember that use to be a wall) has a china cabinet with lighting on the dining room side, open shelving on the end and a spot for two stools on the kitchen side. The counter tops are HD laminate and were made by our cabinet maker. 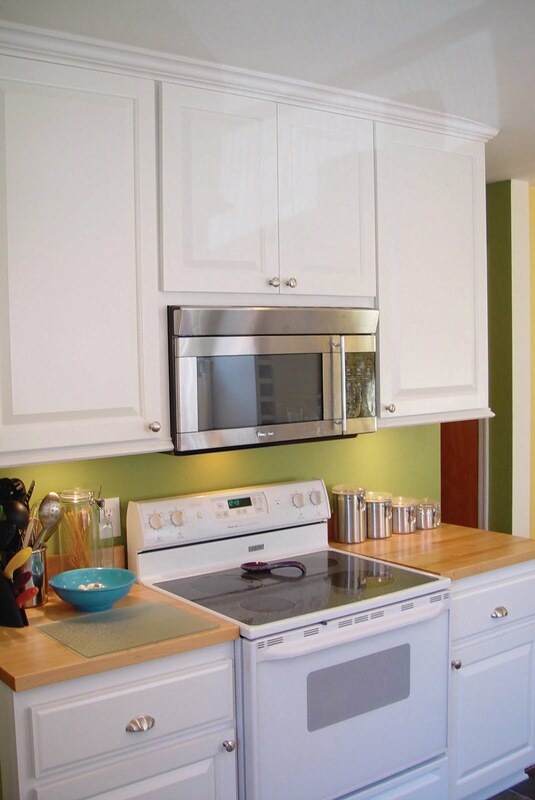 Some day I would love to get a stone counter top and tile the back splash….someday. Well the previous owners and their kitchen table squished up in this corner. Now that we had the open concept with the kitchen stools at the peninsula and the dining room table just on the other side of the peninsula a table didn’t feel necessary. We added seating and storage with a built in window seat. It is the perfect place to hang out with the cook and the storage is great for large items you don’t use often. The cushion was made by my mother-in-law (home economics teacher). It is foam, wrapped in batting with a cover sewn on. I knew I had to go with glass fronts for my dish storage. With a Fiestaware collection like that how could I not? FYI…my mother-in-law is the collector, I just reap the benefits. The cabinets are illuminated inside and the glass shelving allows the light to flow through the cabinet. We also put in under cabinet lighting. Check out the pull out garbage (best kept out of sight). Nothing too exciting over here. The butcher block was salvaged from the kitchen and refinished. The above the range microwave is new. Not the kind of thing you want to install twice, which is why we replaced it with the remodel. The best part of the whole remodel is how it opened our house up. This is a view from the kitchen. This makes keeping taps on the kids and socializing/hosting so much easier. Phase one is definitely where we made most of our changes in our kitchen. But as we lived with it we made some tweaks to make it work better, or just because we needed to change things up or felt like having some fun! Great project I am about to undertake a similar gutting. I came here for peninsular ideas. Kudos to u.